Click image to enlarge Deschutes River, Oregon, looking downstream towards it's mouth, from Heritage Landing State Park. Image taken May 12, 2014. The Deschutes River begins on the east slope of the Cascade Mountains southwest of Bend, Oregon, flows north through Central Oregon, and enters the Columbia River at River Mile (RM) 204. 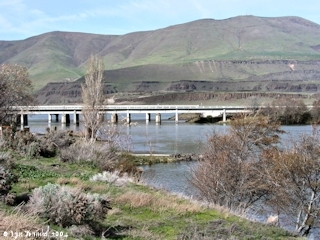 Five miles upstream is Biggs Junction, Oregon and the Sam Hill Memorial Bridge, connecting Oregon with Washignton. Across from the mouth of the Deschutes hugging the Washington shore, is Miller Island, and slightly upstream on the Washington side is the Maryhill Museum and the location of Maryhill, Washington. Downstream on the Washington side is the small community of Wishram. 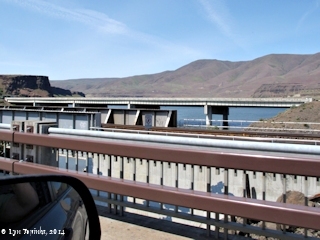 On the Oregon side of the Columbia River, west of the Deschutes drainages rises the basalts of Fulton Ridge while further downstream lie Celilo Park, the Oregon Trunk Railroad Bridge, and The Dalles Dam. 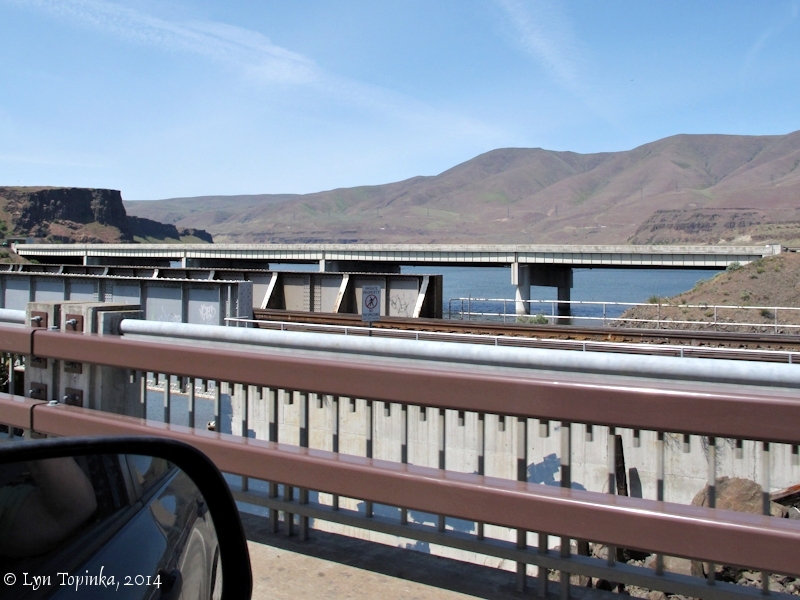 Fifteen miles downstream is the community of The Dalles. Early fur traders called the Deschutes drainage "Riviere des Chutes", French for "river of the falls", because of its close proximity to the "La Grand Dalle de la Columbia", The Dalles. Click image to enlarge Deschutes River, Oregon, looking downstream towards it's mouth, from Deschutes River State Recreation Area. Image taken May 12, 2014. According to the Columbia Basin Fish and Wildlife Authority website, (2004), the Deschutes River drainage covers approximately 10,500 square miles and is second in size only to the Willamette River drainage in northwestern Oregon. The Deschutes Basin is bounded on the west by the Cascade Mountains, on the south by high elevation pine forest, on the east by the high desert plateau, and on the north by the Columbia River, and is separated into upper and lower sections. The lower section of the Deschutes reaches the Columbia at River Mile (RM) 205, and covers approximately 2,700 square miles with 760 miles of perennial streams and 1,440 miles of intermittent streams. It drops in elevation from 1,393 feet at the Pelton Dam (RM 100), to 160 feet at its confluence with the Columbia River. The major geologic formations of the lower Deschutes area include The Dalles, John Day, and Clarno formations and basalt flows of the Columbia River Basalt Group. Loess, volcanic ash and pumice have been laid down during recent geologic times. Much of the original deposits of loess and ash have been eroded from the uplands and deposited along the streams. 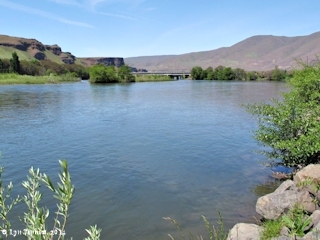 Click image to enlarge Mouth of the Deschutes River, Oregon. View from Washington State Highway 14. Miller Island is tip in lower left corner. Image taken May 24, 2005. On their journey down the Columbia River in 1805, Lewis and Clark decline to name the Deschutes River, writing they will name it on their return journey. Later in the passage however, Clark does call the river the "Towarnehiooks River", the Indian words for calling the river "the River on which the Snake Indians live". On their route map (Moulton, vol.1, map#77) the river appears as "Clark's River". In his journal entries for 1806, Captain Lewis used "Clarks River". Captain Clark used "Clarks River" in his first draft and "To war nah hi ooks" river in his final draft. Both Lewis's and Clark's entries for April 22, 1806, use "Clarks River". On April 22, 1806 Captain Clark stood on a ridge near Haystack Butte, Washington, and looked across the Columbia River to the south. Patrick Gass calls the Deschutes River the "Sho-sho-ne River" in his passages for October 22, 1805 and April 21, 1806. Moulton (2007) states (April 21, 1806) that Gass's name refers to the "Snake" (Paiute) Indians living on the river, whom he supposes to be the same as the Shoshones (Snakes) the party encountered in Idaho. Early fur traders called the Deschutes drainage "Riviere des Chutes", French for "river of the falls", because of its close proximity to the "La Grand Dalle de la Columbia" The Dalles. In 1812 Wilson Price Hunt writes the Indian's call the river "Tou-et-ka". In 1838 the "Map of the United States Territory of Oregon West of the Rocky Mountains, ..." had the river labeled "Chutes or Falls R.". "... MILLER, 84.4 m. (168 alt., 11 pop. ), is a grain shipping station. US 30 crosses the Deschutes River, 85.3 m., on the CHIEF DUC-SAC-HI BRIDGE, an arched concrete structure named for a chief of the Wasco tribe, who operated the first ferry across the river. The Deschutes, often designated on old maps as Falls River, has been an important fishing stream for both Indians and whites. Lewis and Clark found that the river, "which is called by the Indians Towahnahiooks," was "divided by numbers of large rocks, and Small Islands covered by a low growth of timber." 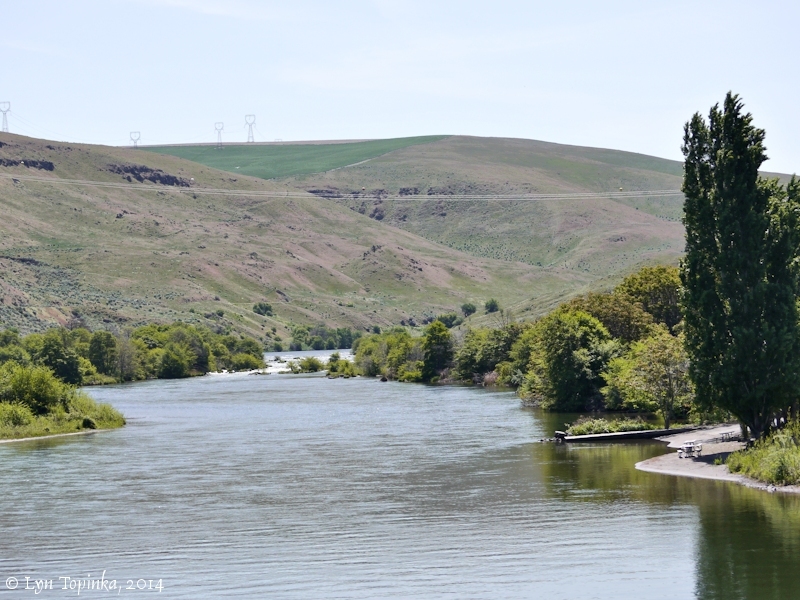 ..."
Click image to enlarge Deschutes River, Oregon, looking towards mouth. 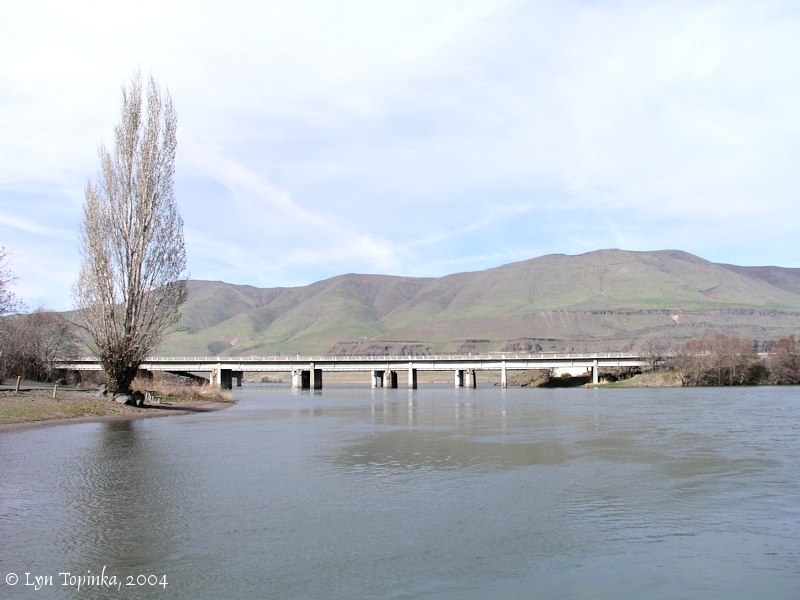 Looking towards the mouth of the Deschutes River, and the old Oregon Highway 30 bridge across the Deschutes. View from Heritage Landing State Park, left bank of the Deschutes. Image taken March 20, 2004. Click image to enlarge Deschutes River, Oregon, looking upstream. View from old Oregon Highway 30. 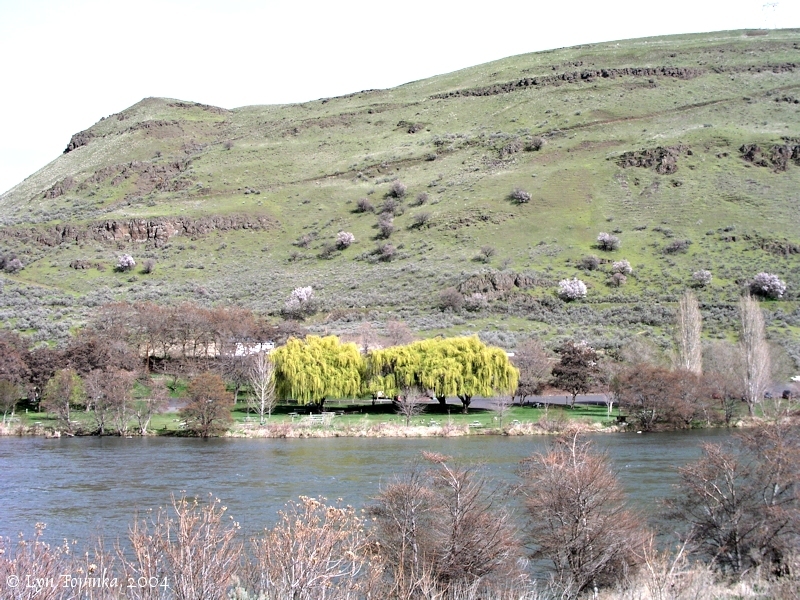 Boat launch from Heritage Landing State Park is visible on the left bank of the Deschutes (right view in image). Image taken May 12, 2014. 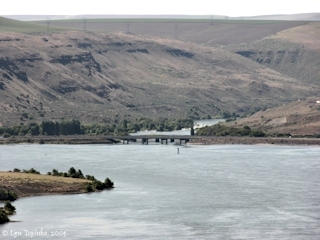 Click image to enlarge Deschutes River, Oregon, looking downstream towards it's mouth towards the Columbia River. View from old Oregon Highway 30 heading west. Image taken May 12, 2014. Two Oregon State Parks and Recreation Areas are located at the mouth of the Deschutes River. Heritage Landing State Park is on the left bank of the Deschutes River (west side), just upstream from its confluence with the Columbia River, while the Deschutes River State Recreation Area is on the right bank (east side). "Acquired between 1963 and 1983 by purchase from various owners, transfer by the U.S. Army Corps of Engineers, and gifts of land from the Oregon Wildlife Heritage Foundation. 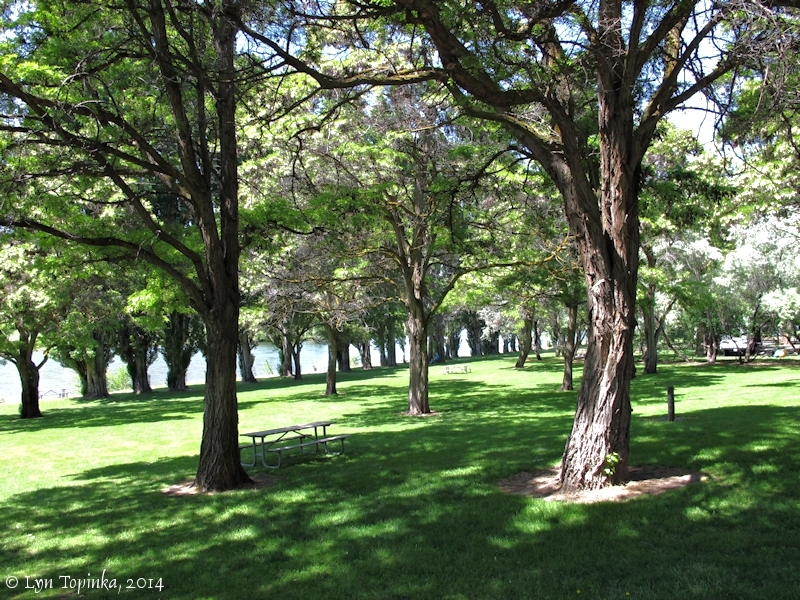 The original tract for the area was 30 acres purchased in 1963 from the Columbia-Deschutes Power Company. This tract, with some of the later acquisitions, forms the developed portion of a riverside recreation complex. Adjoining the State Recreation Area is the Deschutes River Scenic Waterway. The lower Deschutes River from Pelton Dam to the Columbia River, some 104 river miles, was designated an Oregon Scenic Waterway in 1970. The purpose is to protect and enhance scenic, recreational, fish and wildlife values along the river while allowing public use of the river for boating, fishing and riverside camping. The Oregon Parks and Recreation Department manages the waterway in cooperation with Sherman and Wasco counties, U.S. Bureau of Land Management, Confederated Tribes of the Warm Springs Reservation, Oregon Fish and Wildlife Department, State Marine Board and Oregon State Police." Source: Oregon State Parks website, 2014, Deschutes River State Recreation Area, Park History. 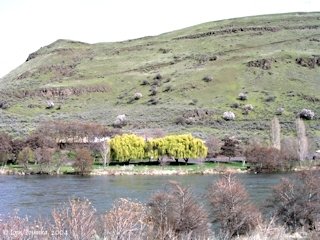 Click image to enlarge Deschutes River State Recreation Area as seen from Heritage Landing State Park. Image taken March 20, 2004. Click image to enlarge Deschutes River State Recreation Area, on the east bank of the Deschutes River, Oregon. Image taken May 12, 2014. Click image to enlarge Great Horned Owls, "mom" and kid, Deschutes River State Recreation Area, Oregon. Image taken May 12, 2014. Deschutes State Park is located on Interstate Highway 80N, at the confluence of the Deschutes and Columbia Rivers, 17 miles east of The Dalles at the Wasco-Sherman County line. Discussions on this proposed project were started in 1955. Detailed studies were made in 1959 to determine possible use, entrances, construction costs, effect a possible power project with a large fluctuating discharge might have on the safety of the stream for park users, the sediment carried by the river, etc. 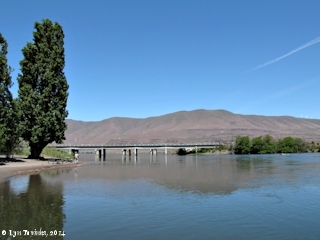 The prime movers in the project are The Dalles Chamber of Commerce and many interested people living along the banks and inland from the Columbia River. The first land obtained was 30 acres, located on the east side of Deschutes River, purchased from the Columbia-Deschutes Power Company on January 25, 1963. An additional 5.10-acre tract was purchased on April 25, 1963, from Don and Dorathen Miller. These tracts adjoin and the latter contained a small home and some other buildings." Two Oregon State Parks and Recreation Areas are located at the mouth of the Deschutes River. 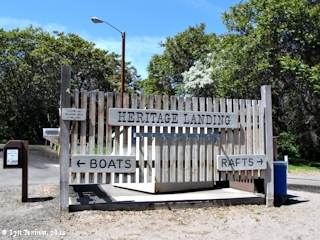 Heritage Landing State Park is on the left bank of the Deschutes River (west side), just upstream from its confluence with the Columbia River, while the Deschutes River State Recreation Area is on the right bank (east side). 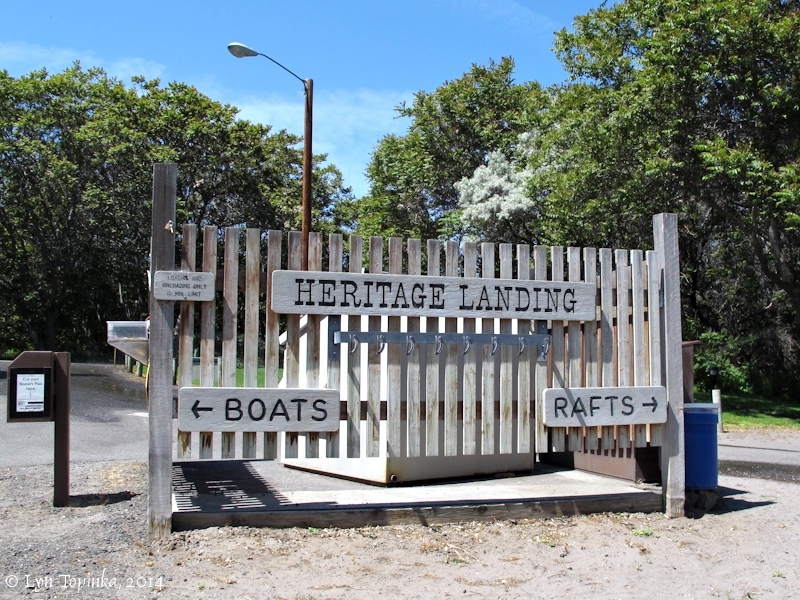 Heritage Landing is a popular boat launch and day use area which provides river access to both the Columbia River and the Deschutes River. "The first tract of land was acquired in 1963, when the state purchased thirty acres at the mouth of the Deschutes from the Columbia-Deschutes Power Company. 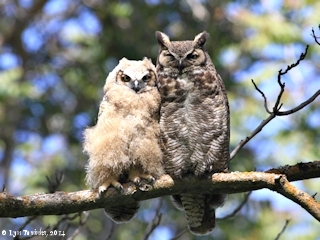 Between 1977 and 1983, the Oregon Parks and Recreation Department acquired 134.37 acres of frontage lands abutting the scenic waterway through transactions with private owners, using funds raised by the Wildlife Heritage Foundation. Between 1998 and 2002, the land was officially deeded to OPRD by the Oregon Department of Transportation (ODOT)." 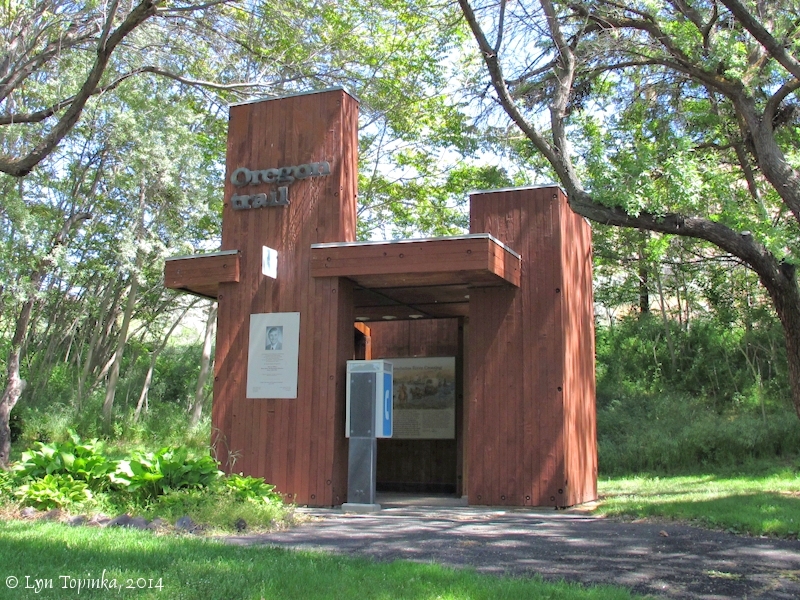 Source: Oregon State Parks website, 2014, Heritage Landing State Park, Park History. 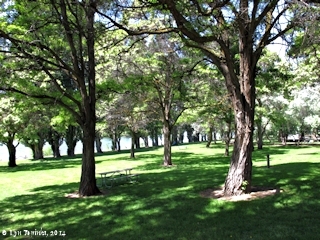 Click image to enlarge Heritage Landing State Park, Deschutes River, Oregon. Image taken May 12, 2014. Click image to enlarge Deschutes River from Heritage Landing State Park. Image taken March 20, 2004. "The Lower Deschutes River was designated an Oregon Scenic Waterway in 1970 and a Federal Wild and Scenic River in 1988. The river runs through a deep rimrock-lined canyon that ranges from 900 feet to 2,600 feet in depth. The elevation drops from 1,393 feet at Pelton Reregulation Dam to 160 feet at its confluence with the Columbia River. The average gradient is 13 feet per mile and is relatively constant throughout its length. The most significant drops in gradient are Sherars Falls (River Mile 44), with a vertical drop of 15 feet, and Whitehorse Rapids (River Mile 75), with a vertical drop of approximately 35-40 feet over one mile. Within this canyon you will experience an incredible geologic and cultural history and a diverse community of fish, wildlife and vegetation." 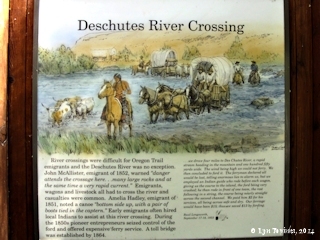 Oregon Trail pioneers had to cross the Deschutes River on their way from Missouri to the Willamette River Valley. 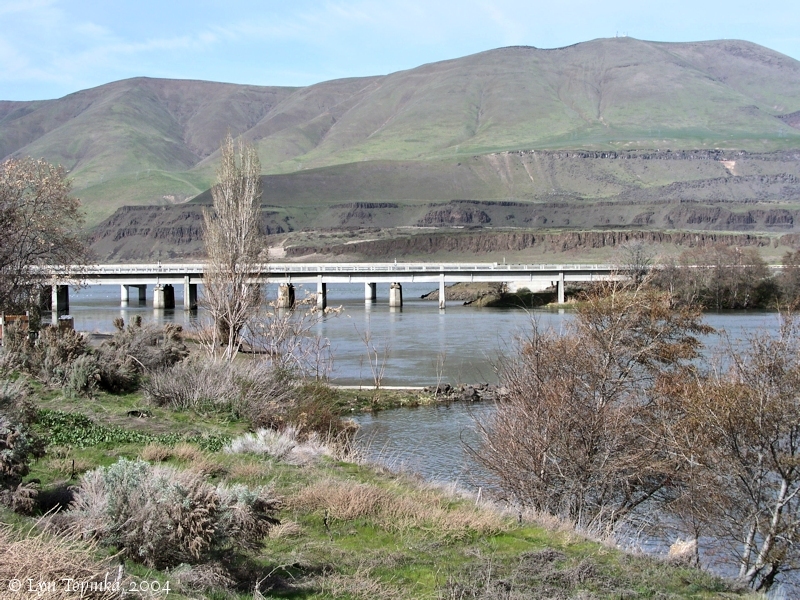 "Emigrants frequently camped at the mouth of the Deschutes River before attempting the difficult crossing of this "considerable tributary of the Columbia." Some parties crossed at the mouth of the river, using rocky islands as stepping-stones. Wagons were usually floated across, while the animals swam. Joel Palmer wrote a detailed description of the crossing on September 28, 1845: "The river is about one hundred yards wide, and the current very rapid; the stream is enclosed by lofty cliffs of basaltic rock. Four hundred yards from the Columbia is a rapid or cascade. Within the distance of thirty yards its descent is from fifteen to twenty feet. The current of this stream was so rapid and violet, and withal of such depth, as to require us to ferry it. Some of the companies behind us, however, drove over at its mouth by crossing on a bar."" Source: U.S. National Park Service, Comprehensive Management and Use Plan and Final Environmental Impact Statement, Oregon National Historic Trail. 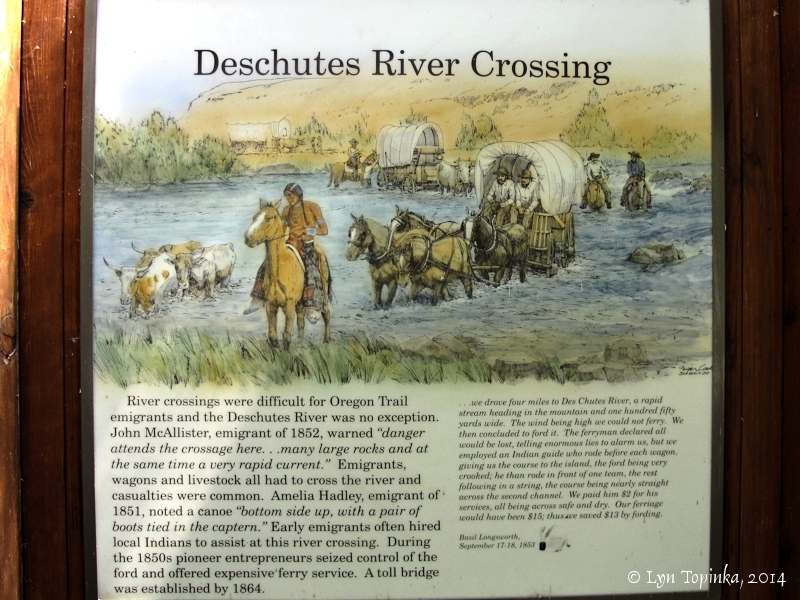 "River crossings were difficult for Oregon Trail emigrants and the Deschutes River was no exception. John McAllister, emigrant of 1852, warned "danger attends the crossage here ... many large rocks and at the same time a very rapid current." Emigrants, wagons and livestock all had to cross the river and casualties were common. Amelia Hadley, emigrant of 1851, noted a canoes "bottom side up, with a pair of boots tied in the captern." Early emigrants often hired local Indians to assist at this river crossing. During the 1850s pioneer entrepreneurs seized control of the ford and offered expensive ferry service. A toll bridge was established by 1864." 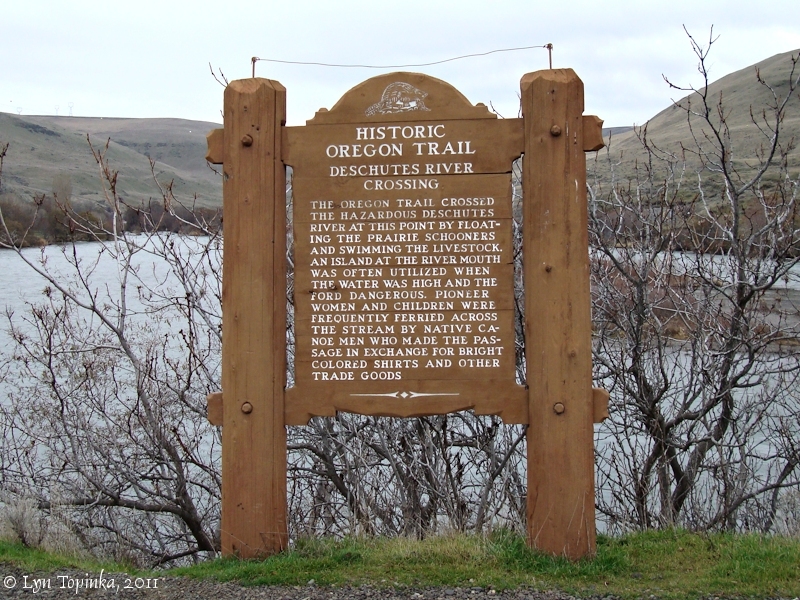 Source: Information sign, Oregon Trail kiosk, Deschutes River State Recreation Area. 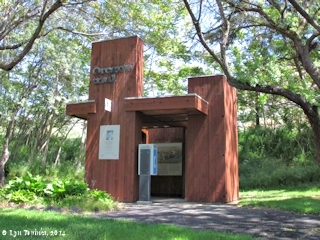 Click image to enlarge Oregon Trail kiosk, Deschutes River State Recreation Area, Deschutes River, Oregon. Image taken May 12, 2014. 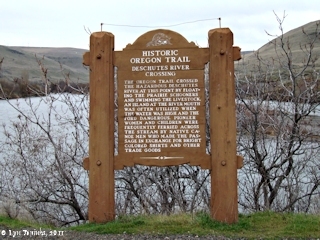 Click image to enlarge Information sign, Oregon Trail kiosk, Deschutes River State Recreation Area, Deschutes River, Oregon. Image taken May 12, 2014. Click image to enlarge Penny Postcard: Bridge crossing the Deschutes River, ca.1910. Penny Postcard, ca.1910, "Bridge over the Deschutes River, Oregon, On the Line of the O.W. R. & N. Co." Published by the Oregon Post Card Co., Portland, Oregon. Card #1387. In the private collection of Lyn Topinka. Click image to enlarge Penny Postcard: Deschutes River Palisades, ca.1910. Penny Postcard, ca.1910, "Palisades of Deschutes River, Oregon. On the line of the O.W.R. & N. Co." Published by the Portland Post Card Co., Portland, Oregon. Card #1395. In the private collection of Lyn Topinka. last night 2 of our horses broke loose and Strayed of at a Short distance. at 7 oClock we loaded up and Set out [their camp was near Haystack Butte], haveing previously Sent off the Canoe with Colter and Potts we had not arived at the top of the hill which is 200 feet [Columbia Hills] before Shabonos horse threw off his load and went with great Speed down the hill to the Village ... and delayed Capt. Lewis and the rear party ... dureing the time the front of the party was waiting for Cap Lewis, I assended a high hill from which I could plainly See the range of Mountains which runs South [Cascade Mountains] from Mt. Hood [Mount Hood, Oregon] as far as I could See. I also discovered the top of Mt. Jefferson [Mount Jefferson, Oregon] which is Covered with Snow and is S 10° W. Mt. Hood is S. 30° W. the range of mountains are Covered with timber and also Mt Hood to a sertain hite. The range of Mountains has Snow on them. I also discovered some timbered land in a S. derection from me, Short of the mountains. Clarks river which mouthes imedeately opposit to me [Deschutes River] forks at about 18 or 20 miles, the West fork runs to the Mt Hood and the main branch Runs from S. E. after Capt Lewis Came up we proceeded on through a open ruged plain about 8 miles to a Village of 6 Houses on the river. here we observed our 2 Canoes passing up on the opposit Side and the Wind too high for them to join us. I halted at the mouth of a run [Historians suggest perhaps Harley Canyon] above the village near Some good grass to let the horses graze and for the party to dine. ... after we proceeded on up the river about 4 miles to a village of 7 mat Lodges. here our Chopunnish guide informed me that the next villg. was at Some distance and that we Could not get to it to night, and that there was no wood to be precured on this Side. a man offered to Sell us a horse for a Canoe. just at the moment we discovered one of our Canoes on the opposit Side. we concluded to Camp here all night with the expectation of precureing some horses [across from the John Day River]. ... the air I find extreemly Cold which blows Continularly from Mt. Hoods Snowey regions. ... we made 14 miles to day with the greatest exirtion. Serjt. Gass & R. Fields joined us with one Canoe this evening. the other Canoe with Colter & pots is a head.